To celebrate Desmond's first trip around the sun we wanted his party to reflect his personality. So what kind of party do you give to a baby that can move a solid wood kitchen table? 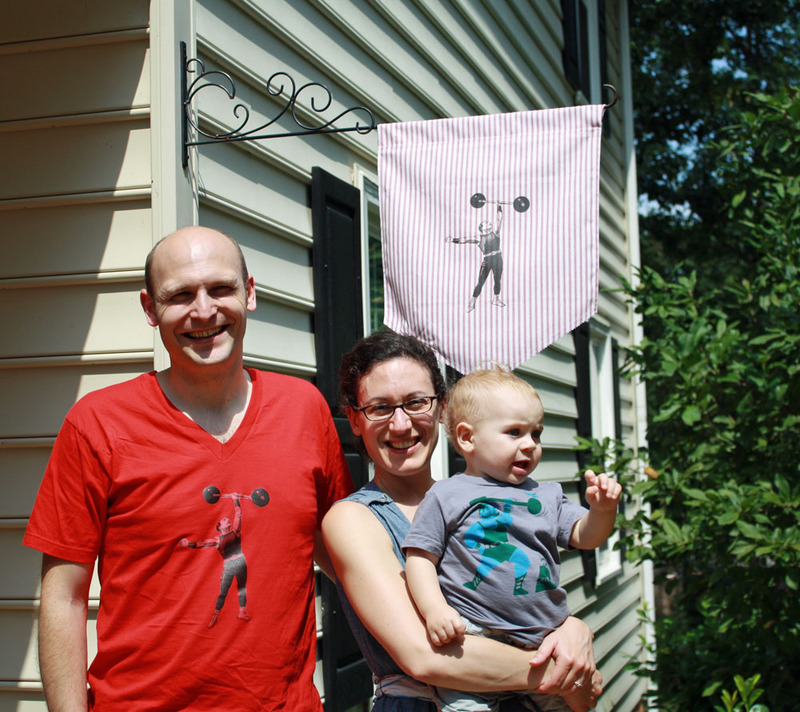 Mama's little strongman got a Strongman themed party! This theme involved a lot of diy on my part and I was so happy to do it. Allow me to give you a tour of my party crafting skills in no particular order. 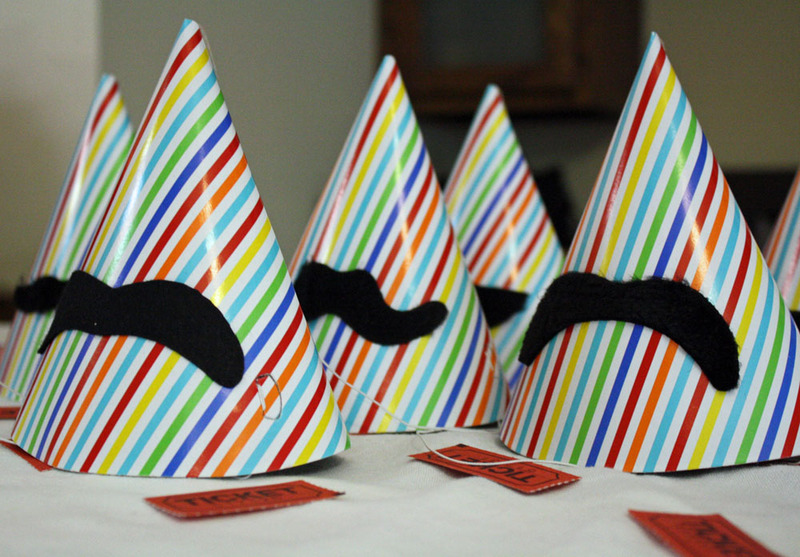 Let's begin with the striped party hats with furry mustache stickers. I had 8 hats and 6 stickers so I did some quick trace and cut using my two favorite mustache shaped sticker backs on black felt, no one knew the difference. 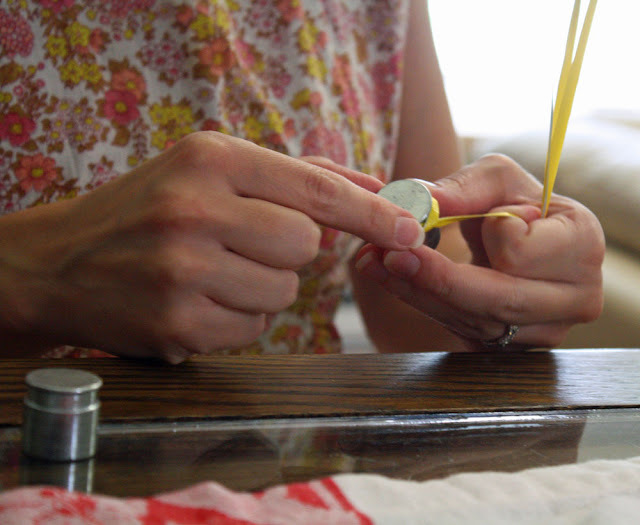 We ended up with a lot of balloons and I grabbed these vintage sewing weights from the studio to split them up and hold them down. They looked very dumbbell-esque to me. 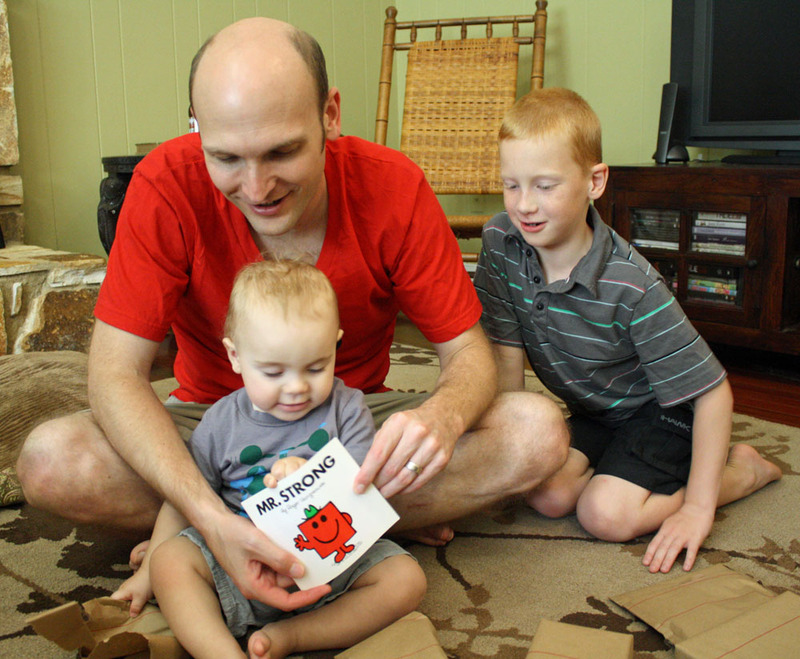 Remember when I diy-ed the invites in this post? Here is what those popcorn bags look like with popcorn in them. They were about three inches taller but I gave them a haircut with my old pinking shears (not the ones I currently use for sewing) because that was just too much popcorn per person. I was right on that, by the way, I'm still eating it. 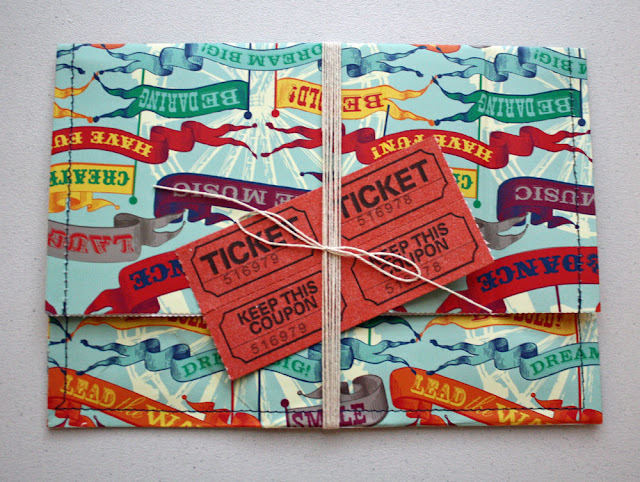 You knew I wouldn't let my dollar-store-ticket-find go to waste. 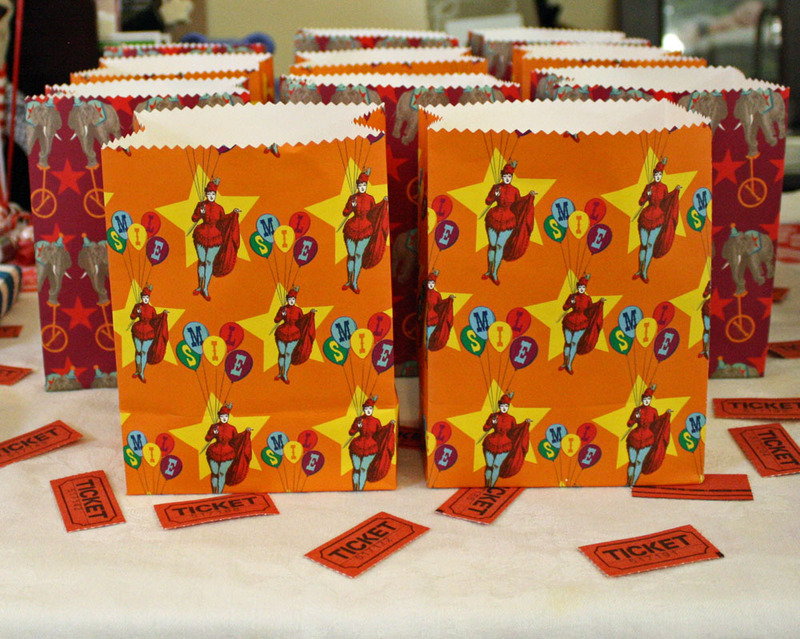 I sprinkled them all over the treat table like a tent floor littered with tickets, only cleaner. Party banner for the treat table! I had the striped fabric and bias tape in my stash. 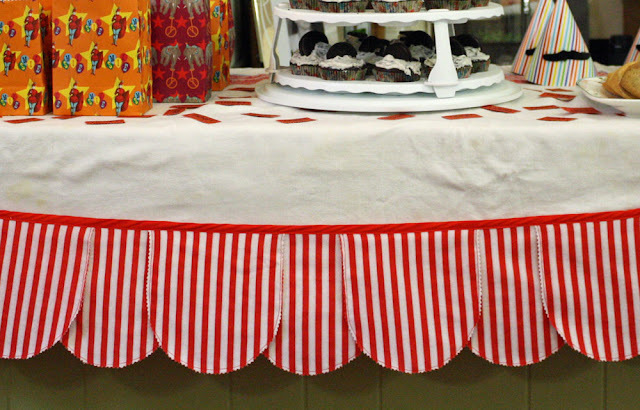 I used the banner pattern from Sewing with Oilcloth by Kelly McCants and layered my pieces to feel tent-like. Full disclosure: I know Kelly and you can catch a couple of glimpses of me modeling in this book. 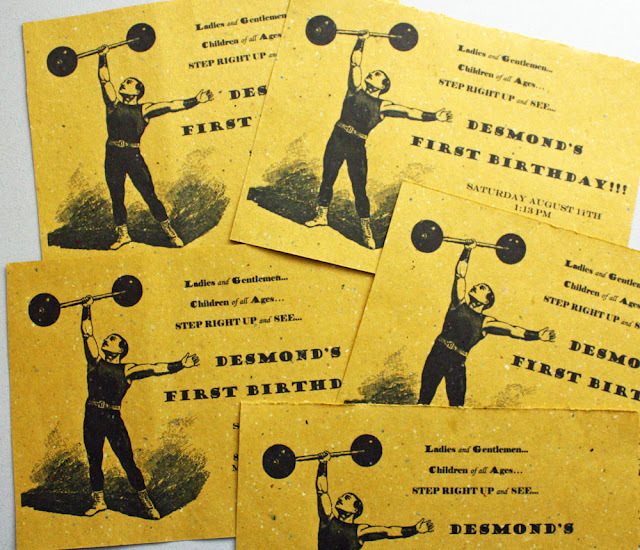 Between Desmond's dairy allergy and the gross amounts of sugar in store bought cakes, oh my, we don't go that route, ever. 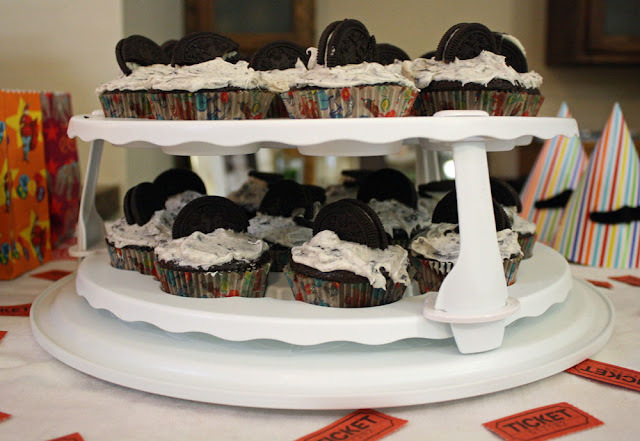 So I whipped up our family favorite, Vegan Oreo Cupcakes. Those actually aren't Oreo's, they are a Whole Foods knock-off that have less bad stuff and taste so much better. If you didn't know already, Oreo's are vegan, and so are these. Desmond's first taste of anything sweeter than an apple. Of course he ate the whole cupcake, didn't share any with the dog, and I only half watched through parted fingers like it was a horror movie. I can't let the circus bib go unnoticed, it was part of the stash I made back here. Time for presents!!! Desmond's only handmade by mama present was Sal but note the red striped craft paper in the bottom right corner, I got super hi-tech crafty on this one. 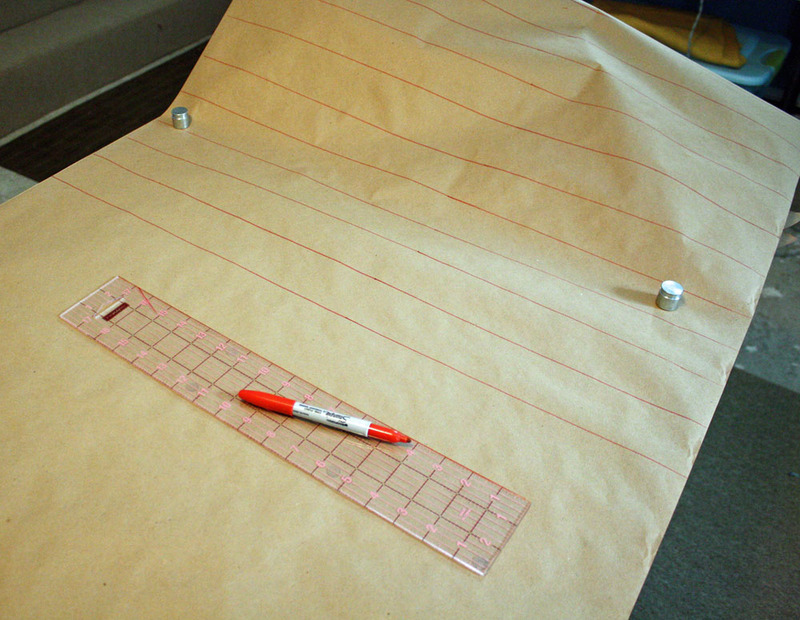 Yep, it took me all of 15 minutes to draw stripes on the entire roll. After wrapping packages I had enough left over to cover the present table and the buffet. 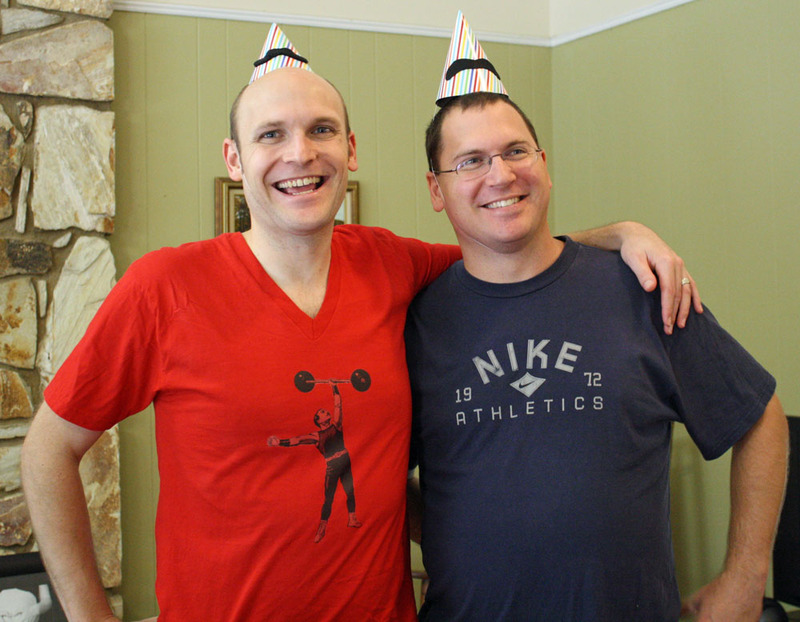 Ignore the fact that my husband and his brother look slightly deranged in this photo and let's talk t-shirts. The most expensive birthday project was Dana's t-shirt because I had to buy a new (re: clean) one and we went Made in USA with American Apparel. 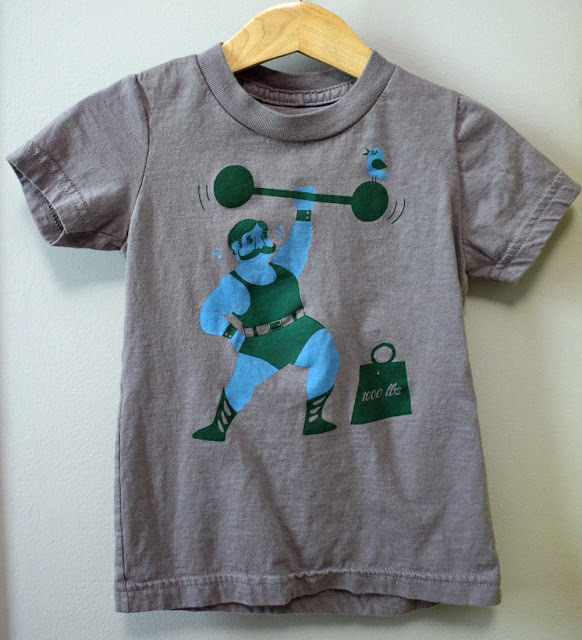 I had some iron-on transfer paper and printed out our strongman from the invites, remember him. Ah! And there he is again! I made this quicky flag for our front porch using the same iron-on transfer technique. 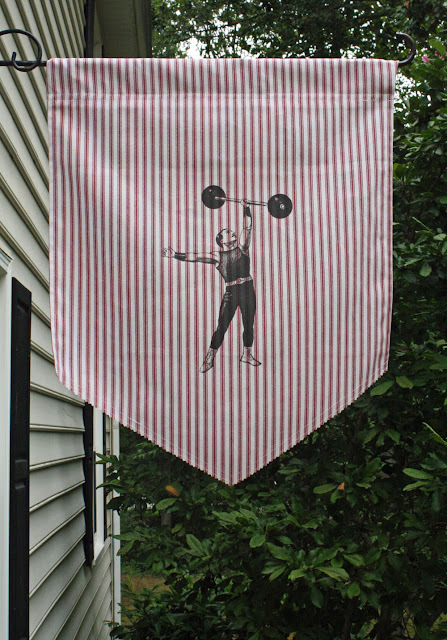 Our neighborhood is big on porch flags, and we aren't, but the hardware was already on our house and this added a great side-show feel. Nothing says step right up like a strongman flag. Yes, it's still on display. It wasn't just Dada who got to wear a strongman tee. We picked up this guy by Pinecone and Chickadee at Crafty Bastards last year when we were vending with a 6-week-old Desmond. He had already earned his nickname. 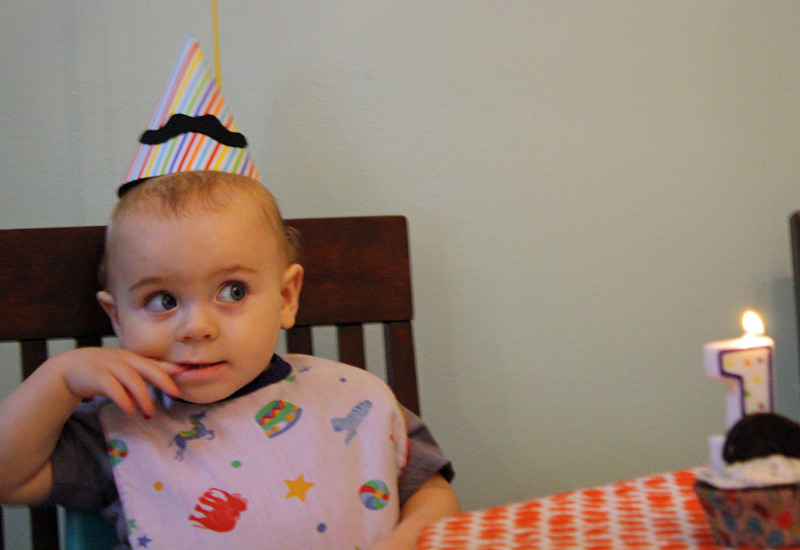 I know parents can get pretty crazy and spend a lot of money on a first birthday. I'm happy to report that we spent WAY more on feeding our family good food instead of the decorations. And it all looked pretty fantastic, if I do say so myself.